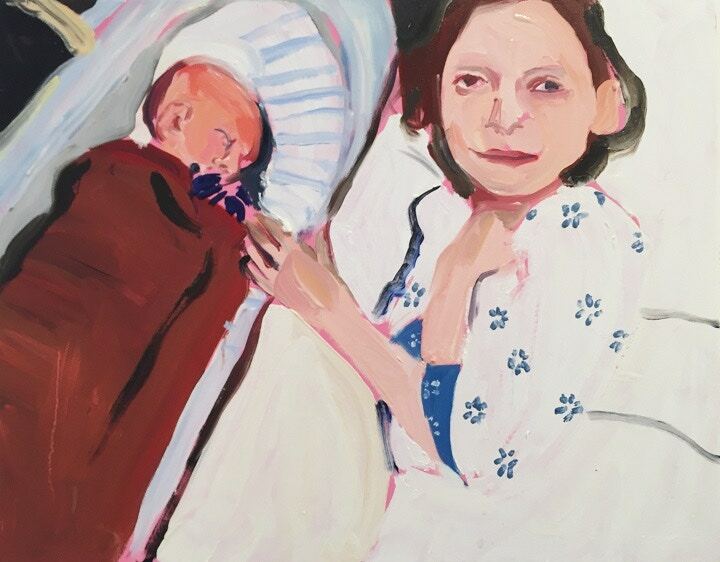 In Chantal Joffe’s show at Victoria Miro, Mayfair, celebrated writers who keep company with the artists’ friends and relatives. Joffe prompts a re-evaluation of notions of self-disclosure and intimacy in the making of work. Cass Art visited her studio in London to find out more about the show, her practice and her new found love of pastels. 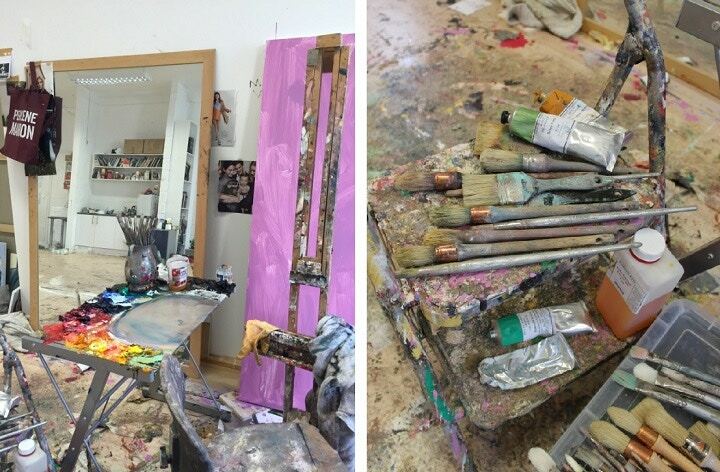 Joffe’s studio is every painter’s dream. Light floods in the huge windows, pastel works bursting with vibrant colour cover the floor on one side, books and reference material litter the desk and shelves, and piles of Michael Harding paint, brushes and pastels are heaped on the tables. A huge mirror, perfect for self-portraits reflects her works in progress, colourful paintings and drawings that line the walls. Can you tell us a bit about your new show at Victoria Miro and the inspiration behind it? I’d been reading a lot of poet biography, a lot about Robert Lowell and people I’ve always been interested in, Sylvia Plath and some of the other confessional poets, and I kept thinking could you make a painted equivalent of that somehow. So I ended up painting portraits of them from biographies so that’s some of the work in that show along with quite a lot of paintings of my daughter. There is a room of pastel drawings in the show, is this a recent development in your work? Yes I started making pastel drawings which I hadn’t really done before. I got more and more keen on it and I began to do them really obsessively, doing one of my mother and then myself naked and then my sister and my daughter, some big ones. I was thinking a lot about Degas and Vuillard. Because I’d never used pastels you’re sort of inventing your own technique. You have to work more broadly in pastel because they are brutal and you have to see in light more than in detail. They are so intense and everything is so vivid. Every day I go to Cass Art and buy another box of Sennellier pastels, they’re the best. Do you think it’s important for artists to try new mediums? It’s been really useful in terms of trying not to stay the same, which is such a danger in painting, trying not to get stuck in one’s own mannerisms, I’m always having to say to myself, ‘I don’t want to have a way’, I mean of course one does but I don’t want to because that sort of narrows it all down. Some of these pastel works were so new I wasn’t sure how to show them or what I thought. I knew I was unbelievably excited about them, it was the first time I’d made pastels let alone shown them. And then at the show people were really positive about them and so I was so happy because I’d been so nervous about the show anyway. You know when something’s new to you and you think maybe it’s good or maybe I’m deluded by the sheer pleasure I have in doing it! I wanted rawness and I was trying to find different ways to get there, it was important they weren’t in any way narrative or illustrational, it’s hard to find a balance with figurative art. I felt like I’d gone back to art college, I loved being at art school and that feeling of constantly changing, it’s rare, the older I get the harder it is to feel that. You’re always looking for that sense of newness about making things. Do you feel the same excitement when you paint? Like everybody, I experience boredom, despair and occasional bits of good! But when I was doing the pastels I would finish the day and I’d be desperate to come back to do some more. I couldn’t stop. I go through patches of that, high bits and low bits. There are people who work in a measured way but I work in manic bursts. I’m in the studio every day, you have to be there, you have to turn up, everything else is jam but you’re not going to make anything if you’re not there. That’s the advice I’d give to people just starting out. An ability to be on your own is also important. 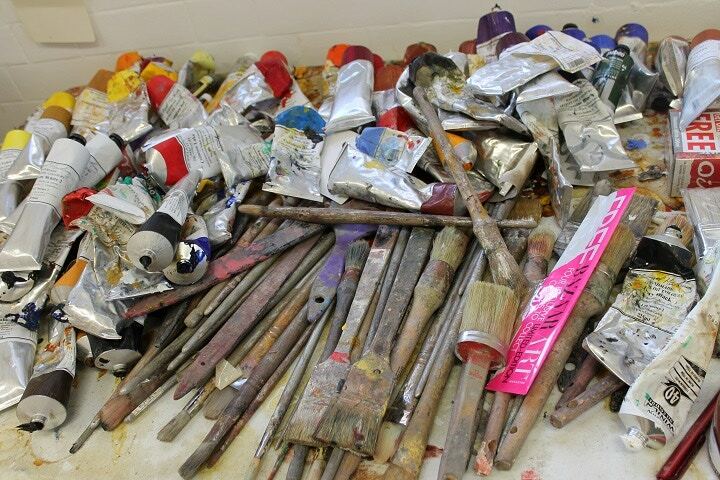 What are your essential materials for painting? Do you have any top tips? I like Michael Harding oils, I like to buy a random assortment of colours like Amethyst or Crimson and Emerald. My favourite brushes are Pro Arte and I wash my brushes probably four times a day. My top tip for brush washing is Imperial Leather soap because it’s hard. I use Cold Pressed Linseed Oil to help make my paints fluid and it helps to keep the colour clean. For me I everything is about keeping the colour clean, as un-muddied as possible. If you muddy it you’ve had it from the outset. I don’t use turps anymore because I don’t like the smell. 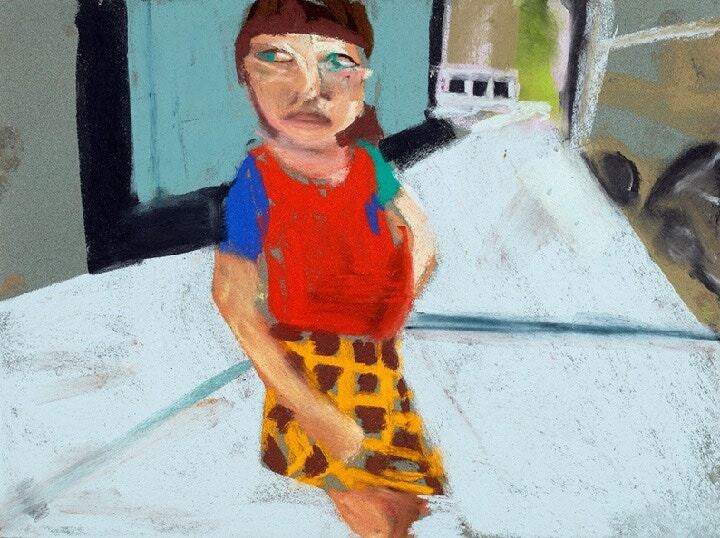 You’ve painted a lot of self-portraits and there are two in your current show. What do you enjoy about making them? With yourself you don’t have to care about any feelings, you can do what you want to yourself so that’s very liberating. There’s a huge pleasure in describing things other people would find really awful. There’s a piece in the current show, Self Portrait in Red Jumper, and I had such pleasure making that painting, it’s like a game of how honest you can be and how hard on yourself. Peeling away your own vanity. Anybody can look hard at other people but to do it to yourself is much more entertaining. 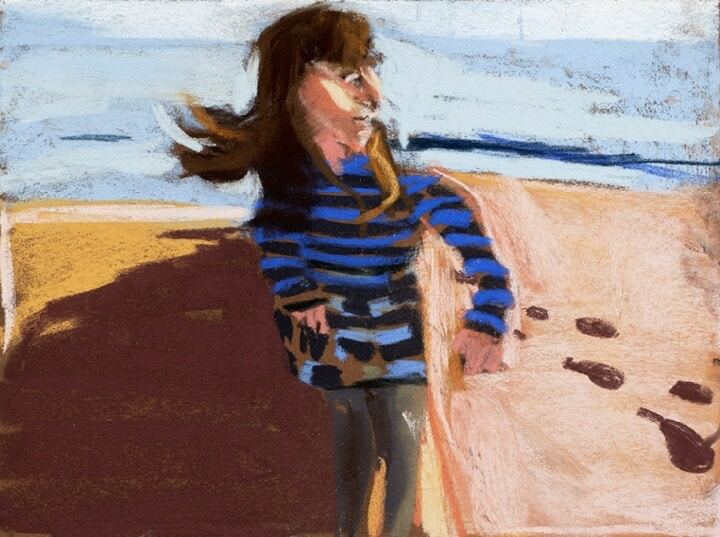 I’m not sure I’d distinguish between ugly and pretty but if I’m painting myself I fall in love with awkwardness. I like the way a hand folds back or a foot sticks up, or how hunched I could look, I like what the body can do. You often paint on bright, colourful grounds, and use a range of surfaces. What’s your preference? I choose the ground colour fairly randomly, at one point I was using apple green because Degas used that a lot and then I was using pink because Guston used pink. The choice of ground colour is a feeling really. If you’re painting people painting white against white is very hard. I paint on pretty much anything, I use those Pebeo canvases partly because of the texture and partly because of the colour. I like Ampersand panels but I also make my own and I also use canvas. I go back and forth between them but board is probably my greatest love. We know about the poets and writers you admire but which artists have influendced you? It depends on the day of the week really, Matisse, Munch, El Greco, Corbet, De Kooning, Vuillard, Bonnard, Dianne Arbus, Guston, Paula Modersohn Becker because she’s less known and really great, look her up. 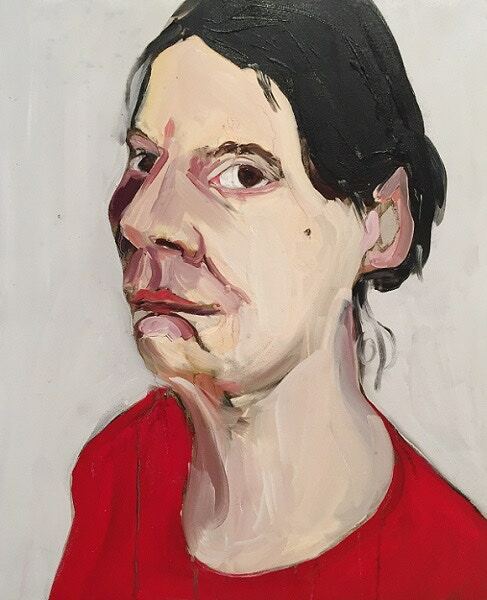 'Chantal Joffe' was on display at Victoria Miro Mayfair, 14 St George Street London W1S 1FE until 24 March 2016. Visit the website here for further information.